My dad was considered to be something of a sceptic, a cynic even. A man of few words himself, he was always suspicious of anyone – particularly politicians – whose verbal skills seemed able to justify even the most disreputable of actions. ‘Whatever they say, they are just out to make money,’ was one of his recurring sentiments, and he even saw fiddling and chicanery in what seemed to us the most unlikely places. For example, he thought that cricket matches were ‘fixed’. Now, one can easily imagine a boxing match being fixed, or a formula one car race, or the Tour de France, but cricket? How on earth could they do it? Why on earth would they do it? My dad’s answer was simple. Cricket test matches are scheduled to last for five days, but they can be over earlier if each side has had its allotted two innings. So, to gain maximum revenue from spectators, steps are taken to ensure that the game lasts as long as possible. We used to laugh at this particular opinion, but twenty years after his death a number of scandals broke which vindicated him. The South African cricket captain Hanse Kronje was convicted of match fraud, and other top-class cricketers were implicated. They were betting that their own side would lose and taking steps to facilitate that outcome. Later, footballers, particularly goalkeepers, were accused of similar fraudulent activity. My dad’s pessimistic approach to life can be explained, in part at least, by his life-experiences. He was born in 1907 and began to work down the mines at just 13. He lived through the First World War, the General Strike of 1926, the great economic slump of the thirties, and the Second World War. It would have been hard for a working class man to find too much in these experiences to give him confidence in the political or economic systems which seemed always to benefit the rich and to keep people like him in their place. For all that my dad was a powerful presence within the family, I never followed his example. I was more influenced by my mother who, despite living through substantially the same experiences as my dad, always seemed more optimistic. She was conventionally religious, and she would generally give people the benefit of the doubt, rarely imputing mercenary motives to people in the way that my dad customarily would. I inherited my mother’s religious outlook and her general optimism, but as the years have gone on I have at times found myself drifting more and more in the direction of my father. Getting older is certainly the main reason for this. You realise that you have seen it all before, and that despite the rhetoric of politicians and religious leaders, things will go along pretty much as they always have, the rich getting richer and the poor getting poorer. You become resigned to the fact that commercial interests will continue to exploit our insecurities in the name of profit; that popular culture will continue its descent into previously unimagined depths of banality and tawdriness; and that religions will continue to squabble over trivialities. One is often tempted to ask whether it is all worthwhile, whether liberal religion, and liberal values in general have any merit, whether one’s own puny efforts are not impotent and irrelevant, and whether it wouldn’t be better to forget about it all, protect oneself against the encroachments of a corrupt society and live out one’s days in curmudgeonly isolation. As we get older we tend to become more right wing (although my father never did), and we begin to suspect that the old solutions – more discipline in schools, more punishment of criminals, and the iron fist against the enemy all seem to have more appeal. Things are made worse, of course, by the winter cold and darkness; it’s much more difficult to be hopeful in the dark, and much more difficult to be sociable in the cold. In recent years, too, the gloom has increased because of the general economic downturn, which has left us all feeling vulnerable and exposed. And it is at such a time, in the very depths of the earth’s winter and the soul’s dismay that the Jewish festival of Hanukkah comes round. Hanukkah is a moveable feast. It begins on 25th of the Jewish month Kislev, and is usually in December, but it can occur in November. This year it begins on the 8th December and lasts until the 16th. We Christians tend to ignore it, even if we are aware of it, or to see it as just an attempt on the part of the Jews to share in the Christmas spirit. But I think it has something very important to teach us. Hanukkah means ‘dedication’. The festival celebrates the rededication of the Jerusalem Temple in 164 BCE, after it had been desecrated by the soldiers of the Syrian king, Antiochus Epiphanes. Antiochus had invaded Palestine and had attempted a wholesale Hellenisation of Jewish culture. Circumcision was outlawed, a huge statue of the pagan god Zeus was erected in the Jerusalem Temple, and pigs were slaughtered on the Temple altar. Judas Maccabeus organised a revolt and eventually the invaders were expelled. What could possibly be the relevance of this rather fanciful story to people like us? Rabbi Arthur Waskow, an American Jew who works closely with liberals in all the religious traditions, including Unitarians, tells us: we may not have a temple of stone to rededicate, but we can and must rededicate ourselves. Now is the time, the time of maximum darkness, to light, or relight our own little candle and recommit ourselves to those very values which time and circumstance seem to be eroding. A determination to bear in mind these words of the American poet Miller Williams: Have compassion for everyone you meet, even if they don't want it. What appears bad manners, an ill temper or cynicism is always a sign of things no ears have heard, no eyes have seen. You do not know what wars are going on down there where the spirit meets the bone. You no doubt have your own list of principles that it would do well for you to reconsider and then silently renew. The morning is the best time for this. Before you fall asleep at night you should review your day; the night is best for contemplation. But the morning is best for commitment. Catholics are taught to say a ‘morning offering’ first thing, a dedication of everything they do that day to the higher purposes of God. Our ‘morning rededication’ has a similar purpose and should be done with as much fervour and regularity as we can muster. In this way we can help fight against the dreadful encroachments of world weariness and resignation. We need to renew our dedication to the community which gives us strength and support in our efforts. Maybe it’s our Unitarian community, maybe it’s some other one. Whatever it is, we must constantly tell ourselves that on our own we are weak, but together we are strong. 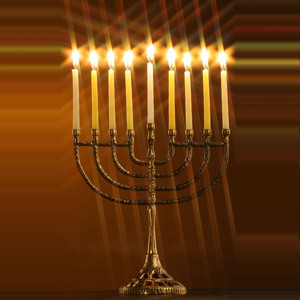 On each day of the festival, the Jewish people will light one more candle on their Hanukkah menorah. It’s a good image of the power of community: the flame spreads, the light increases. This poem by Marge Piercy, which I used to read on membership Sunday in Dublin, reminds us of the importance of solidarity. A dozen makes a demonstration. Together we have power. Judas Maccabeus and small band of committed fighters overcame the might of an empire. ‘Never doubt that a small group of thoughtful, committed, citizens can change the world. Indeed, it is the only thing that ever has,’ said Margaret Mead. But the Hanukkah story has another lesson to teach us. It tells us that when we rededicate ourselves miracles occur. Although there was only enough oil for one day, it held out for the duration of the festival. But, says Arthur Waskow, this was not the real miracle of Hanukkah. The real miracle was that although they only had enough oil to last for one day, they lit the menorah anyway. They could have given up. They could have followed the advice of the pessimists who were no doubt telling them that it was pointless. Just as Homer Simpson said to Bart, ‘If at first you don’t succeed, give up.’ But they didn’t. They went ahead, in spite of the odds that were stacked against them. These are the lessons of Hanukkah: recommitment; rededication; solidarity; determination to act even though there seems little chance of any success. Its message is that we should light candles of hope, rather than curse the darkness in despair. These are the best antidotes we possess to that creeping cynicism which constantly tempts us to relax our efforts and even to abandon them. We must not give in to hopelessness. My dad indeed tended towards pessimism, but he never surrendered to it completely, because he saw real positive and beneficial changes in his lifetime. In his view, the National Health Service in Britain was a colossal step forward, which was made because the people willed it and enlightened politicians engineered it. On a more personal level, the introduction of pit-head baths transformed his life and the life of his family. I can remember the miners coming home from work caked in coal dust and bathing in tin baths in front of the fire. But collective effort brought about a change which enabled the miners to walk home from work with some dignity.